Florence, 1919. The count Camillo Negroni, with the complicity of Angelo Tesauro, barman of the elegant Caffè Casoni in Via de 'Tornabuoni, invented his own personal version of the Americano, a particularly popular cocktail in those years. And he did it by saving the Campari and also the red vermouth, but replacing the soda with something a little bit stronger. The gin, to be precise. Thus was born a drink destined to become a legend and to reach 100 years of life brilliantly, without ever losing its charm: the Negroni, in fact. But what would have happened if the dear count had decided to leave Tuscany and leave for the Sicily, maybe to put yourself on the trail of another high-ranking family like the Altavilla family? 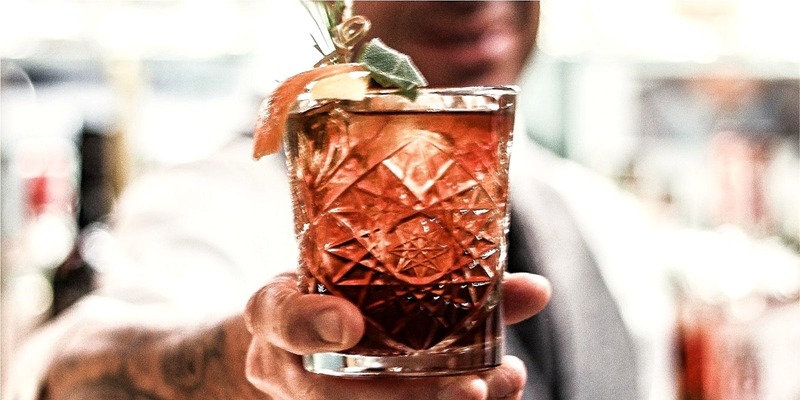 It is from this imaginary cross between houses, historical periods, territories and suggestions that the Negroni D’Altavilla, an alternative – and very Mediterranean – version of the iconic drink developed by the bartender of Mixology Bar from Milan Gianluca Amoni. "This cocktail is the fruit of work that has been going on for years, but has its roots in my personal experience", Amoni tells us. «My mother is originally from Ragusa, and I still remember when I was a child I spent summers at my grandparents' house. Those fragrances, those flavors, those products that still come to my mind today were the basis for creating this recipe . Here then is preserved the "1/3 + 1/3 + 1/3" rule, which wants the three main ingredients used in the same proportion. But the protagonists change in the glass: Campari remains, as a bitter, enhanced by a teaspoon of china Clementi, to push on the bitter notes; gin is flavored with carob, left to infuse for about a week; and instead of vermouth theEtnabitter, with its notes of orange, almond and honey. Defining the etnabitter is not easy. A little vermouth, a little bitter, a little aperitif in the broadest sense: this product, which takes its name from the famous Sicilian volcano, presents itself in all respects as a wide-spectrum liqueur, to be tasted with some ice cubes to savor all the Mediterranean nuances – ranging from citrus fruits to aromatic herbs, starting from a base of Sicilian wine -, or to be used as a new, original ingredient in mixing. Bitter, yes, but with an abundance of sweet notesin short, that make it particularly soft on the palate. Like a Sicilian pastry, but with 18% alcohol. Not bad. "Compared to the traditional Negroni, in this variant the initial note changes, which inevitably becomes more fresh and Mediterranean, while the bitter remains as background", explains Gianluca Amoni, whose cocktail was recently selected and applauded by the Negroni Club of Pisa. Here is his recipe for a special tribute to 100 years of the Negroni, to prepare and taste imagining the good Count Camillo lying in the sun of Noto and surroundings. With glass on hand, of course. Lemon peel, sage and rosemary to complete the cocktail.